My sister studied cooking and food preparation for several years, so I’m a bit familiar with the strain of the kitchen and was keen to see this film, partly for her sake, and largely to whet my own appetite for something sweet. I’ll admit that it wasn’t quite what I imagined it would be, but it more than met expectations. Unlike the Food Network challenges many may of us are – probably – familiar with, Kings of Pastry doesn’t focus on time-restricted design and assembly. Instead, the film offers a glimpse into the ultra-competitive, surprisingly stressful world of high-performance pastry. Conception, planning, timed trial runs and final products are captured on film for the wonderment of viewers. Only 16 out of some 70 entrants make it to the final competition in Lyon, France, where most will return home empty-handed. Chef Jacquy Pfeiffer, founder of the French Pastry School in Chicago, is one of the 16 elite vying for the coveted red-, white- and blue-striped collar and title of Meilleur Ouvrier de France (Best Craftsman of France). 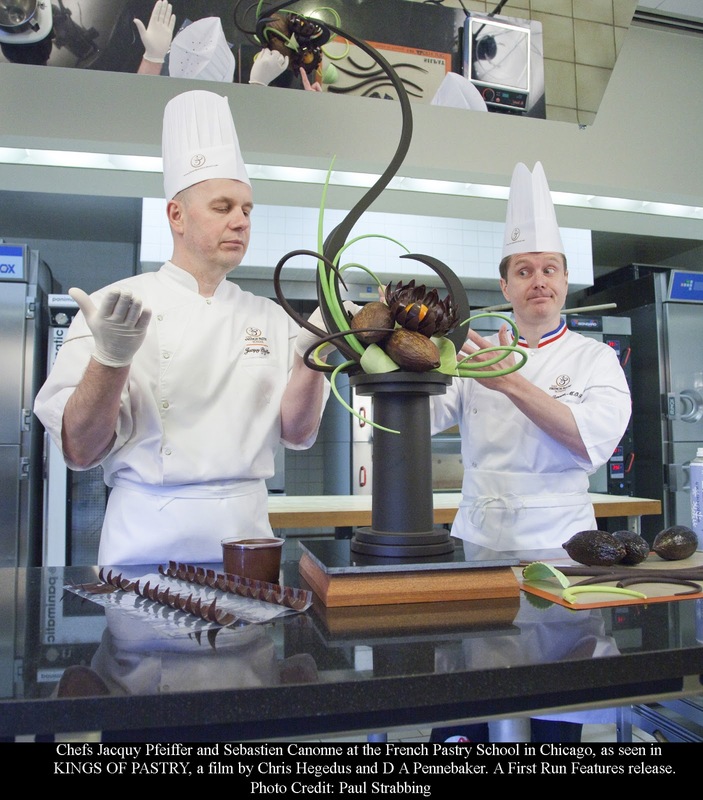 Held every four years, the competition is a three-day event that requires contestants to create elaborate sugar and chocolate sculptures, amongst a selection of assorted pastries, cakes and desserts. With days starting as early as 4 am, each chef battles against exhaustion, frazzled nerves and the unwelcome effects of high humidity to create their edible masterpieces. In the midst of the challenge, the judges surprise contestant with yet another task, allowing them to use only those ingredients and tools already in their arsenal. Every aspect of the competition is meticulously observed and critiqued by a panel of MOF’s – pastry chef’s who have received the title of Meilleur Ouvrier de France. From preparation, to plating, to taste and presentation, things as seemingly unimportant as a broken cookie or imperfections in a pane of sugar can spell disaster. The film pays attention to the intricate beauty of these fragile works while superbly conveying the extreme tension each contestant faces, not only over the three-day challenge, but for months or years leading up to it. Altogether, Kings of Pastry was a captivating, intelligent and, needless to say, eye-opening documentary. Current or aspiring chefs, foodies, artists, sculptors and curious admirers alike will marvel at the undeniable skill and dedication demonstrated by these Kings of pastry. You can catch Kings of Pastry on Friday, September 24th, 7:30pm at the Globe Theatre.